One of the largest, high quality diamonds discovered to date has been found at a mine in South Africa, mining group Petra Diamonds has revealed. The 507 carat stone, which could be worth in excess of $20m (£12.5m), was found with three other large diamonds. They were discovered at the famous Cullinan mine, where the largest diamond in history was found more than 100 years ago. The new find is being analysed by experts to determine its true value. 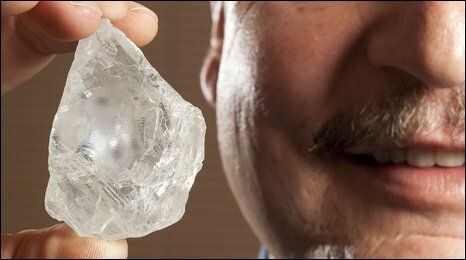 A 480 carat diamond found at the end of last year fetched $18m. "The Cullinan mine has again given the world a spectacularly beautiful and important diamond," said Petra's chief executive Johan Dippenaar. "Initial indications are that it is of exceptional colour and clarity, which suggest extraordinary potential for its polished yield." Petra said the stone is one of the 20 biggest, high quality diamonds to have been found. A 168 carat stone was also discovered, alongside one of 58 carats and another of 53 carats. The largest diamond to be discovered, named the Cullinan, was 3,106 carats. It was cut into nine separate stones, many of which are in the British Crown Jewels.